Republican Senate candidate Marco Rubio told an anti-gay marriage group Saturday the country is relying too much on the government, in part because of a breakdown of family and faith values over the last 50 years. "You know what the fastest growing religion in America is? Statism. The growing reliance on government," Rubio said. "Every time a problem emerges, increasingly the reaction in American society is 'Well what can government do about it?'" America became the greatest country because of its strong society where people did not sit back and wait for government to act, he said. "They did it themselves," Rubio said. 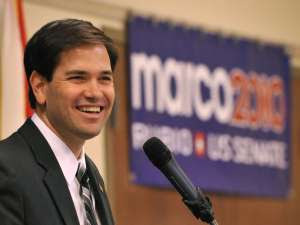 Rubio, a lock for the GOP nomination now that Gov. Charlie Crist has decided to run as an independent, spent the day reinforcing conservative values, capped with a speech before the group that led the effort to put a gay marriage ban in the state constitution. He said the strongest institution in society is the family, and that children raised in stable families are privileged no matter what their income.